I have kept adding to two posts about writerly appearances, one srs bzness and one a list of my dreadful misadventures, and I decided to combine them. 😉 Guess which post was longer. Guess how many dreadful misadventures I have had. So Holly Black and I decided, as we would both be at the WFC last winter, that we’d do a mini tour through England together. At the World Fantasy Convention there were many fancy people, like Frances Hardinge and Garth Nix and Neil Gaiman and Elizabeth Bear and Scott Lynch and Joe Hill. Since Holly is fancy, she knew many of them. But even the fanciest of people can bear terrible disillusionment with them! SARAH: Oh you’re wearing a Watership Down T-shirt. I love Watership Down! Who is your favourite rabbit? Mine is Bigwig. SARAH: … This is quite simply an outrage. I go to be alone with my rabbit feelings. JOE HILL: I’ve read all the other books I have t-shirts for. SARAH: Please, sir. You wear a t-shirt of lies. I spent the last day of the Brighton WFC in bed. I did get up at one point to go to the pharmacy. It was shut. I leaned my face against the glass and waited for it to be open. The pharmacist was QUITE STARTLED to see me, but I think relieved that I was not one of the first zombies heralding the apocalypse. Medicated up, Holly and I PROCEEDED on our tour! In London at the amazing Foyle’s bookshop (where you can always find all my books signed because… I come there and sign them by force!) we met up with some beautimous bloggers before the Main Event. They asked us many insightful questions. SARAH: Oh no, is there mascara all over my face?! LOVELY BLOGGERS: No, there isn’t any mascara on your face. SARAH: *feeble fistpump* Forgot to… put on mascara.. again, thank God for my… lackadaisical beauty regime! My eyes were super watery, which meant add contact lenses and everything had a gentle suffusive glow. Holly had her hair dyed a beautimous blue for the tour, and I was so happy because it meant I could always see her. I have problems with faces at the best of times, and never more so when there is a line of people whisking by. SARAH: And who shall I make this out to? SARAH: … *winning smile* And how do you spell that? So I shamed myself by not recognising several lovely people who came out to see me, and also… developed amnesia. LOVELY BLOGGERS RECORDING THE EVENT: Sarah did a mime of running away from her critique partners as if she was a fugitive fleeing from justice. SARAH: … I have no memory of that. SARAH: This is very exciting! I wonder what I will do next. Also Holly and I had decided it would be fun to train our way through England, which as we were both coming from Italy (where neither of us live) was tricky in that our cases were GIGLANORMOUS. HAPLESS BRITISH COMMUTERS: Why would these madwomen bring giant boulders disguised as suitcases on the train? HOLLY & SARAH: Sorry, so sorry, sorry. Caffeine in the name of God! Even caffeine was sometimes denied us. SARAH: I’ll have a flat white, please. COFFEESHOP LADY: What is that? SARAH: It’s a… type of coffee? I think? COFFEESHOP LADY: What kind of coffee? SARAH: I don’t know! I don’t… drink coffee? COFFEESHOP LADY: But you want a coffee. And you don’t know what kind of coffee you want. COFFEESHOP LADY: Is this an American thing? SARAH: Oh yes! It probably is! But I’m not American. COFFEESHOP LADY: … I hate you. SARAH: The lady didn’t know what a flat white was and I didn’t know either. Americanisms, man. 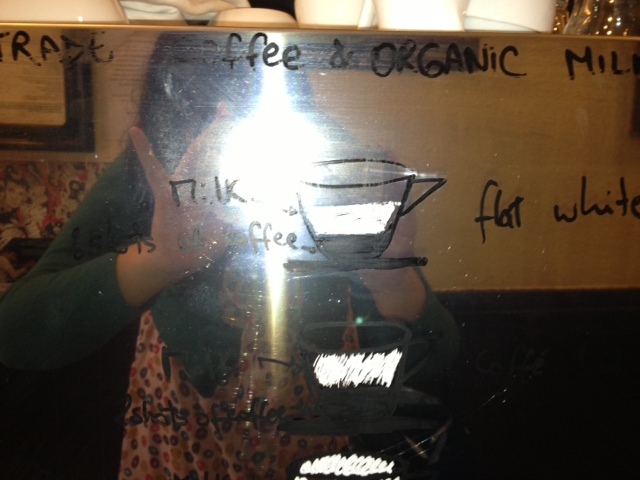 HOLLY: ‘Flat white’ isn’t an Americanism. I got one in Brighton because I saw one on the coffee menu and I wanted to try it. SARAH: So NOBODY knows what it is? COFFEE MYSTERY! Here I got you two coffees. HOLLY: These coffees are very large. In Leeds, it was Bonfire Night. Neither Holly or I were all that aware of Bonfire Night as a Thing. (Note for all those similarly unaware: a celebration involving fireworks and a bonfire, celebrating Guy Fawkes, a dude who tried to blow up part of the English parliament. Whatever, Americans do Thanksgiving, everyone’s got a weird holiday, St Patrick’s Day is basically St. Boozerick’s Day, let’s be real.) I had read a book in which a kid was murdered and dressed up as a Guy Fawkes doll and told Holly the entire plot in great detail, so she would be prepared for Bonfire Night and all it entailed! … In unrelated news she was weirdly jumpy all that day. Probably scared of fireworks. On my daily trip to the pharmacy, I discussed this issue with a kindly pharmacy lady. PHARMACY LADY: So you’re from Ireland? I’ve heard they don’t have Bonfire Night there. SARAH: It’s true. Can I have all the cough drops please. Like, all of them. Don’t hold back, baby. PHARMACY LADY: A neighbour of mine moved to Ireland because there are no fireworks there for her little dog who was terrified of them. SARAH: But we just… but we have fireworks on Halloween. SARAH: Well, let that be a lesson to everybody not to move countries for a dog. But here is the thing: I had a really great time on tour, despite my plague. Because of the people who came. Even though I had to refuse to take a picture with one of their babies because I was Typhoid Mary and their sweet tot could not be contaminated by my touch. In London, I was given a Rubik’s cube necklace for a present. 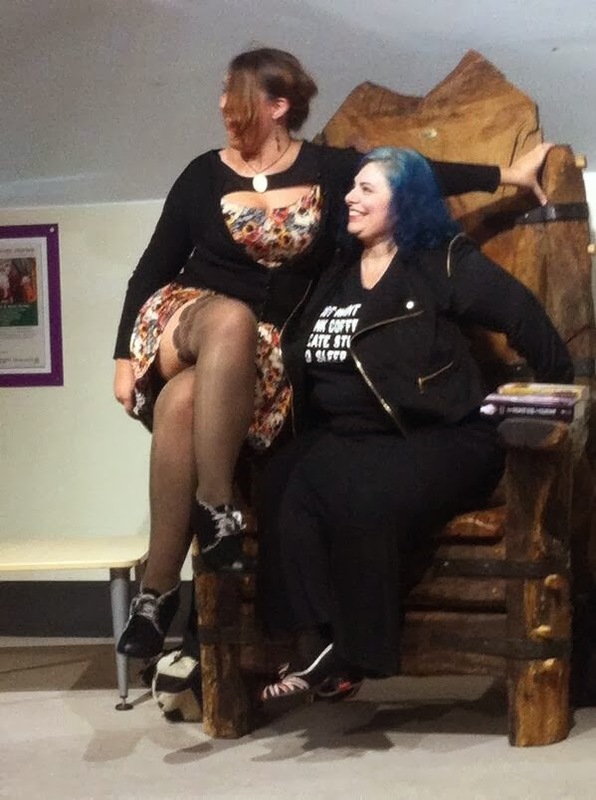 In Newcastle, Holly and I got to sit on a throne. In Leeds, despite the fact it was Bonfire Night and there was mad traffic and fireworks and possible murder dolls, people came to see us! They may have regretted this. SARAH: What are the aliens doing with the sheep? Wait, what do farmers usually do with sheep once it gets dark… oh wow, I heard the words come out of my mouth and I couldn’t stop them. SARAH: Nobody tell your friends about this. It just went so wrong. At the end of the tour, I left Holly (crying softly to myself as I did) and went to Cambridge to give a talk to the most excellent Shirley Society, and I was thrilled to be asked. I did skits from A NUMBER of Gothic novels. I have to say, Jane Eyre always goes down well and I think it’s because I have my Mr Rochester impression down cold. Then I toddled off home. When I got home from Cambridge to Dublin, I had got into a routine of putting on excessive amounts of tour make-up. ROOMIE: Sarah! You’re home! And you said you were sick! But you look great! ROOMIE: … oh I see. When on tour with Holly there were questions about writing LGBTQ characters–Holly, because she is a graceful soul, would answer gracefully. I would probably give everyone whiplash by switching from joking around to being super furiously serious (because I would never want a reader to be hurt by my kidding around). In New Orleans at the Romantic Times convention, I moderated a panel on LGBTQ in YA: those on the panel were Malinda Lo, Scott Tracey, Jenna Black, Suzanne Brockmann and Melanie Brockmann, and it was an honour to moderate them. In Hay on Wye in Wales, otherwise known as the Town of Books which I may have mentioned a time or two before… I had the privilege of interviewing Cassandra Clare and we took readers’ questions, some of which were to do with that very subject. This article shows Cassie saying there should be more LGBTQ fiction in YA: the article itself is great, but the comments to this piece are truly gross. It reminded me of this quote I saw on tumblr – ‘me most of the time: people are okay, I guess. like no one is 100% bad. me after reading the comments section in any article, ever: this world can only be cleansed with fire.’ It is absolutely horrendous that the lovely excited readers at that event, who loved those characters and those pairings, one of whom said she’d been helped come out by these books, have to live in the world that produced these comments. The subject is a wide, wide one: we could barely scratch the surface in New Orleans, though we were able to discuss how several on the panel had moved LGBTQ characters from minor to major over the course of a series, that Malinda Lo’s Ash and Huntress are set in a world without homophobia and how refreshing that is, that we have almost all received hatemail about said content but far more lovemail, that we wanted to see more girls who liked girls. Scott Tracey said that he knew editors and agents who had turned books down explicitly because of LGBTQ content–editors and agents who went on to say they wanted diverse books in public. Malinda Lo said, very truly, that the numbers for LGBTQ YA books were not really on the rise. Cassandra Clare, miles and days later, said there were publishers who turned down her books explicitly because of the LGBTQ content too. I rolled my eyes and said I was sure they were sorry now, and that it had worked out great for her. And it has, and for her readers, but wow there are a lot of roadblocks toward getting this out there. Writers have to want to write it and promote it, publishers have to want to publish and promote it, bookshops have to want to buy in and promote it, readers have to want to buy it and talk it up. At Romantic Times, I met so many lovely people. I was recognised on the street in New Orleans (very exciting, made me feel famous, wish to go back to Bourbon Street, also: there are many dress shops in New Orleans, people don’t tell you about the dress shops.) I had dinner in a restaurant where they keep a special table for the ghost. I also may have visited the World War II museum with Beth Revis and Carrie Ryan, and played dress up. At Hay on Wye, I was super excited because there were celebrities. Maybe too excited. People were worried. SARAH: If I see Judi Dench I’m going to divebomb her. CASSIE: Who was the last person you tackled? When was it? SARAH: It was FIVE DAYS AGO, quit living in the past because I have CHANGED! 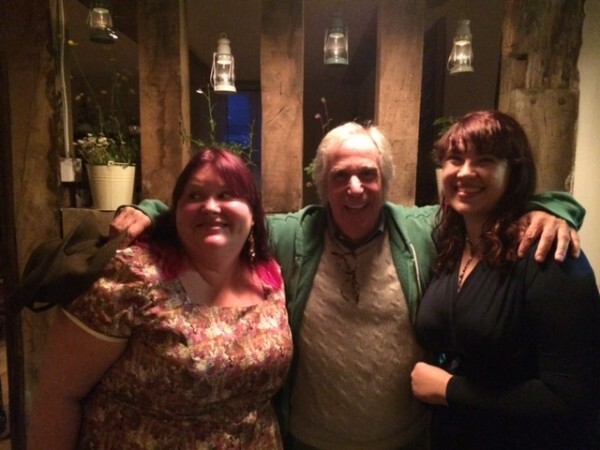 I was super, super excited to meet Henry Winkler, famous for Arrested Development, Hank Zipzer and Happy Days. 😉 But I didn’t divebomb him! Are you guys proud? I hope so. He was the nicest guy in the world, and we talked about events, about dyslexia, about his dad not wanting him to be an actor, about where to buy the best food in New York. He was great. But then I always meet the greatest people at book events. The late great Maya Angelou said “I’ve learned that people will forget what you said, people will forget what you did, but people will never forget how you made them feel.” I’ve always tried to remember it, for events–people came here all this way, entertain them, think of them! But it’s true not just for the people appearing but for everybody. Seeing and meeting readers makes me feel great. I don’t, and I won’t, forget how you all make me feel. And I thank you very much for it! Flat whites were invented in New Zealand, though the Aussies try to steal credit, as usual :P. I don’t think there is a single coffee shop in NZ that doesn’t serve flat whites.